Managing finances has always been a challenging task for any entity, whether they be individuals or businesses. This is because of the number of tasks that need to be done as well as the number, percentages, and financial terms that one needs to understand to be able to come up with an accurate financial statement or financial report. In this article, we will be dealing with financial spreadsheets, what it is, its uses, its advantages and disadvantages, and how you can go about editing an existing financial spreadsheet template. Financial spreadsheet samples in PDF and Excel have been included to serve as your visual aids. You may also compare these samples with another to help you determine their differences and similarities. 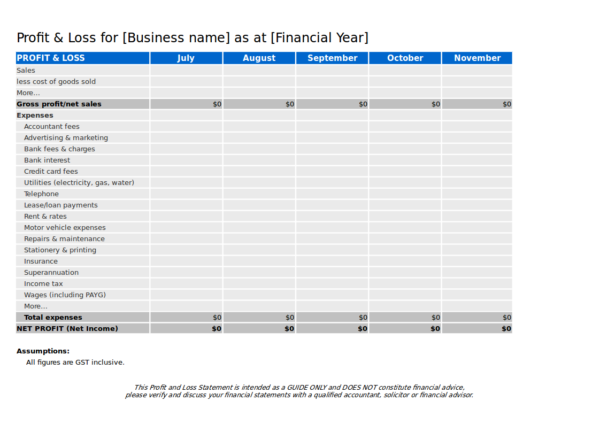 What Is a Financial Spreadsheet? 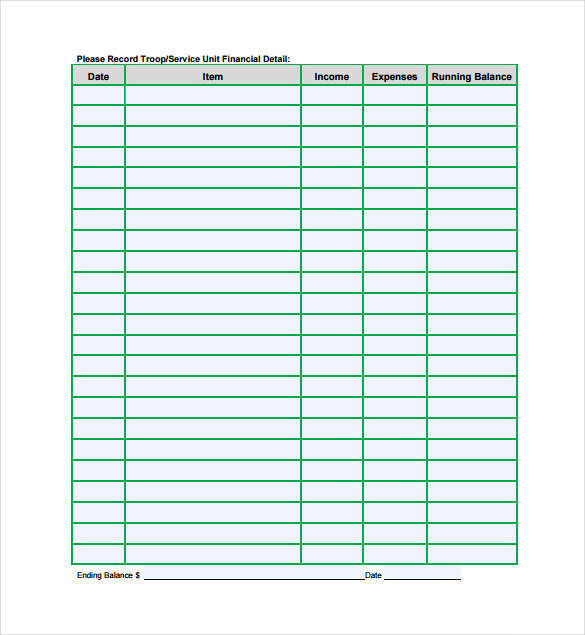 A financial spreadsheet is used both by individuals and companies to help them record and keep track of their finances. It is also a tool that is preferred to be used when reviewing the financial position of an individual or company, as well as a reference when preparing for financial reports. It works hand in hand with financial statements even though they may contain the same thing. Through a financial spreadsheet, the many different components of an individual or company’s finances are systematically and neatly arranged in different columns and rows. It makes data sorting and calculation easy and convenient because each cell in a financial spread is already programmed with the appropriate formula that would come up with the required data result. When talking about spreadsheets, you can never end the topic without mentioning anything about how it can help you manage your expenses. This is perhaps one of the uses that has made spreadsheets useful. And as proof of that, we have gathered the following spreadsheets that can definitely help you with managing your finances. What makes managing your finances difficult has something to do with the formula and calculations involved. Learning these formulas and doing the calculations manually can be a terrifying thing to do, not to mention the horrors of finding out that you have spent more than your budgeted amount. Through calculator spreadsheets, you find how easy and convenient it is to keep track of any of your finances. Plus, you don’t have to learn any formulas or computations as they have already been done for you. What you need to do is key in the required data and the rest is up to the spreadsheet. Mortgage is one of the things that we spend money on and that can also get us off balance with our budgeting. This is no myth as a lot of entities are known to have lost a lot because they weren’t able to keep track of their mortgage payments. The contributing factors are the complexity of the calculations and the number of things that one needs to keep up with in a mortgage amortization. To avoid this tragic situation from happening, mortgage amortization spreadsheets were created to make it easy and convenient for anyone to track their mortgage and ensure that they are able to make their payments on time. In addition, mortgage amortization spreadsheets will also take care of everything from the calculations to the determination of the date of the monthly payments. There are different varieties of Excel budget spreadsheets that can be used and they are based on how an entity prefers to use them. Personal budget spreadsheets are aimed for use by individuals who are looking into managing their daily, weekly, or monthly expenses. It allows them to create the perfect strategy to help them save or pay off their debts. Home budget spreadsheets, on the other hand, are more likely to be used by families to help them with budgeting their earnings so that it would be enough for the entire family within a specific length of time. Other examples of budget spreadsheets are monthly budget sheets and weekly budget spreadsheets. Our expenses make up more than half what we earn. There are instances that even if we are earning more, we still end up spending more. This is because we lack budgeting and expense management. The beauty of expense sheets is that is that it helps you keep track of the things that you spend on so that you can properly budget your earnings. It is true that finding out how much you have spent after going on a shopping spree is terrifying, but it is even scarier to be broke not knowing where your money went. So if you want to be able to manage your expenses, you should start using expense spreadsheets. It is important that you pay off your debt regardless if it was from a loan you made from the bank or a lending institution or if you borrowed it from someone. A debt will still be a debt until you finally pay it back. It is often difficult to pay off your debts, especially if there are a lot of things you have in mind. There are even times when you completely forget about its existence. If that is the case, then you definitely need the help of a debt spreadsheet. It’s not that we are encouraging you to make a lot of debts. The main purpose of a debt spreadsheet is to help you keep track of your debts and help you find ways on how to completely pay them back. The people using these spreadsheets may be different, but its use is undeniably aimed at helping any entity to effectively manage their finances, whether it be with their simple budgeting, expenses, savings, or debts. Financial spreadsheets are truly amazing tools for any financial management. What Is There to See in a Financial Spreadsheet? Using financial spreadsheet samples and templates, you will be able to tell the things that are included in a financial spreadsheet. Checking out more than one two or more samples will help you determine the things that you can commonly see in almost all general financial statement. Below is a list of those things. 1. Heading/Title – This part should never be missed out as this allow for easy identification of the sheet so that it would be used according to what it is made for. The heading or title is often placed at the top part of the simple spreadsheet or on the part provided to display the title of the file. 2. Details of one’s income and expenses – This refers to the entity’s total earnings, actual income, or projected income. By being able to determine this amount, one will be able to effectively budget and manage their expenses. 3. The list of expenses for a particular period – This refers to the breakdown of all that an entity needs to pay or allot money from their income so that they can get by with their adult responsibilities. Examples of the items included in this list are mortgage or rent payments, loan payments, property taxes, food expenditures, utility payments, and other necessities. For businesses and other institutions, the list may comprise of accountant fees, advertising and marketing, bank interest, leas or loan payments, employee wages, etc. You may also see inventory spreadsheet templates. 4. Savings/ Deposits made on savings – It records the amount of money that an entity has deposited on their savings account for this time period. It could be on a monthly basis or every payday depending on the entity’s preference. 5. The date and time involved – It could be the date when new data is entered into the spreadsheet, or the date that is covered by one’s income and expenses. This is often the the current pay day until the next pay day. You may also like sample tracking spreadsheets. 6. Automatic calculations – One unique feature about spreadsheets, no matter what type it is and for what it is used for, is that they automatically do the calculations every time new data is entered into the sheet. This is the most common thing that you will encounter with any spreadsheet. To know more about different spreadsheets, you can drop by our website and check out the samples and templates that we are offering. To name a few are payroll spreadsheets samples and templates, amortization spreadsheet samples, and cash flow spreadsheet samples and templates. 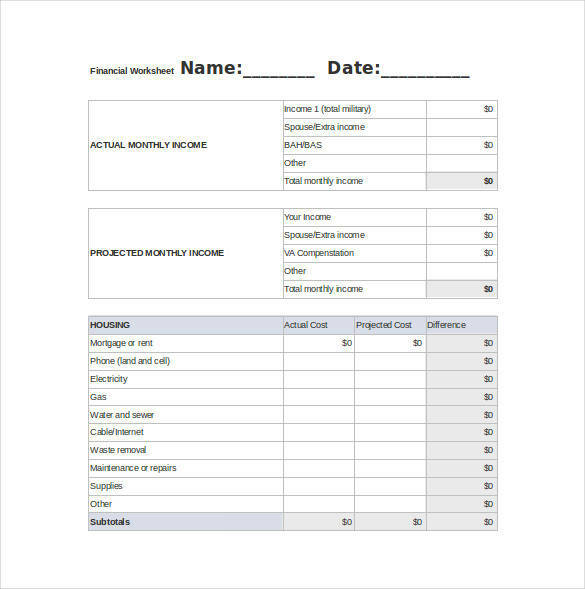 You just browsed online and found the perfect financial spreadsheet template in Excel that you would want to use for managing your finances. The only problem is you do not know how it is used or what to do with it to make it your own. It’s not that difficult. We will help you get started. Just follow the steps that we have provided for you below. 1. Download the blank spreadsheet template that you have found online. It could also be a spreadsheet sample in Excel. Even if it already has data entered, you can still modify and use them as your own. 2. After downloading, look for the file in your Downloads folder. Double-click to open it or right-click on the file and select the Open option that would appear. The Excel application will launch and open the file in front of you. Just make sure that you have the Excel application installed in your computer or laptop so that you can open or edit Excel files. You may also see sample budget spreadsheets. 3. Maximize the Excel window if it is small or just half of the screen. It is better to work on the template when you can see everything that you have on the spreadsheet. So now you have the whole spreadsheet template occupying the entire screen and you can see everything clearly from there. 4. There will be blank cells where you need to enter data. It would contain different things and the format would be different depending on the template that you have downloaded. If you already know the data to enter, go ahead and fill them in. If you don’t, then take time to do your research or understand what information it is asking for. 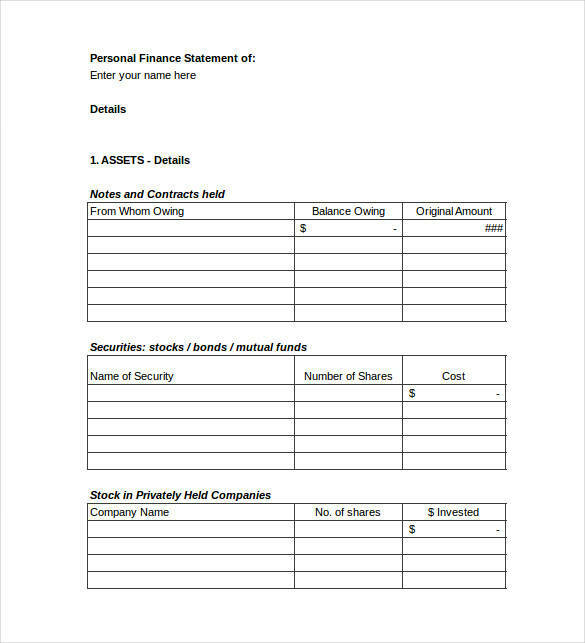 You may also like cash flow spreadsheet samples and templates. 5. It may take some time on your first attempt, but once you get a hang of it you will find yourself breeze through the cells that need to be filled out. 6. Carefully fill in or enter the needed data on their appropriate cells. Mind what you enter and never be in a rush. Everything you work on will all be about numbers and it’s easy to get confused or enter the wrong data when everything is almost identical. 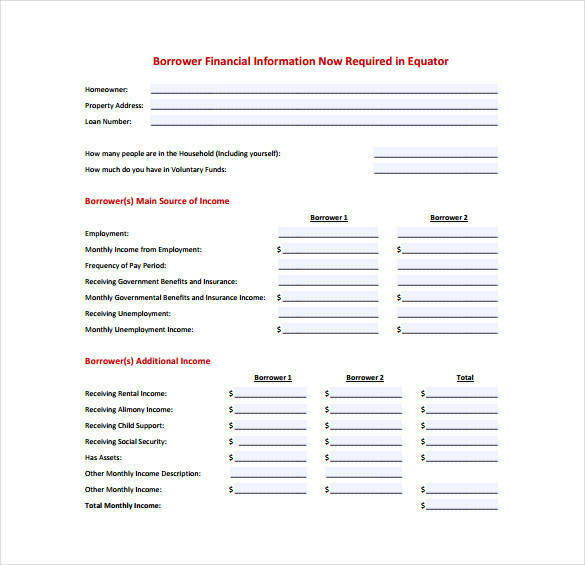 You may also check out debt spreadsheet samples & templates. 7. It is also difficult to find the root cause of the problem when dealing with numbers unless you have a very keen eye for details. That is why it is better to be careful with the data you enter rather than look for the wrong data that was entered. Finding the wrong data will definitely take up more time than entering it correctly. 8. If you are really having a hard time, pause for a while and try to look at similar samples, like budget spreadsheet Excel samples or study the things that you need to know about financial statements. 9. Once you have had filled or refreshed your brain with new information, return to the financial spreadsheet that you have been working on and have it completed. 10. As you fill in the cells with data, you will notice that numbers automatically populate on some cells. That is just normal and that indicates that the calculation formula programmed to the spreadsheet are working. Just leave them be. You also do not need to change or fill in those cells manually. You may also see amortization spreadsheet samples. 11. When you are done putting in all the needed data in their appropriate cells, don’t stare at it. Review your financial spreadsheet once again. You can review it as many times as you want until you are satisfied that everything you have entered is correct. 12. Finally, you can now save your work. To save your work as the original document, click on the File menu and select Save or use the CTRL+S hotkeys. To save your work as another document, select the Save As option in the File menu or use the CRTL+Shift+S hotkeys. This will save your work into a separate document and keep the original content of the template before it was edited. You may also like sample home budget spreadsheets. 13. Print a copy of your spreadsheet if you need to by using CTRL+P and it will direct you to the printer settings. There you have it! You can use the steps above with any spreadsheet template or sample in Excel file that you want to use. There is more to learn about spreadsheets and that includes their advantages and disadvantages. It is common to a lot of people to think about the good part about suing something, as well as its downside. For you to be able to decide if the advantages outweigh the risks, you should know what its advantages and disadvantages are. You may also see calculator spreadsheet samples and templates. Spreadsheets automatically calculates data because it has already been programmed with the formula to come up with the desired results of the computation. This makes it very easy and convenient to use them. In addition to automatic calculations, the calculations provided by the spreadsheet are guaranteed to be 100 percent accurate. You may also like sample personal budget spreadsheets. The information that is laid out for you in a spreadsheet is organized making it easy to navigate or look for the items that you need to fill out. It is also easy to edit the cells whenever you wish to add or make changes to it without fear of destroying the format of the entire sheet. It is also fairly easy to sort data with the use of a spreadsheet as formatting and organizing tools are available to make everything easier. You may also check out loan amortization spreadsheet samples. Charts and graphs can also be created with the use of spreadsheet without having to manually draw them yourself. You just need to select the type of graph that suits the data you have at hand and it will automatically add the values to the graph or chart that it draws. Labels are also automatically added. Both preparation and the actual reporting of an entity’s finances can be done easily withe the use of financial spreadsheet. 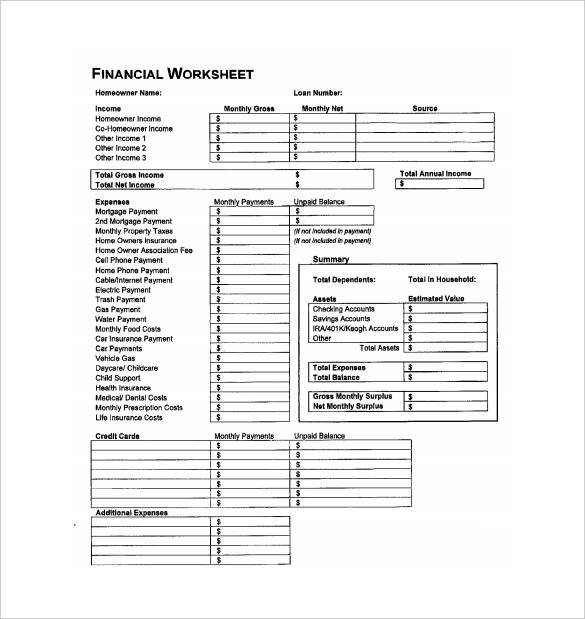 You might be interested in budget spreadsheet templates. Although it has been proven that spreadsheets do calculations accurately, the results still depends largely on the person or data being entered into the cells. If the data entered are all correct, then it is likely that the result of the calculation will be accurate. If the data entered is not the right digits or if it had been entered in the wrong cells, the spreadsheet will still calculate it accurately but the results will no longer be reliable. 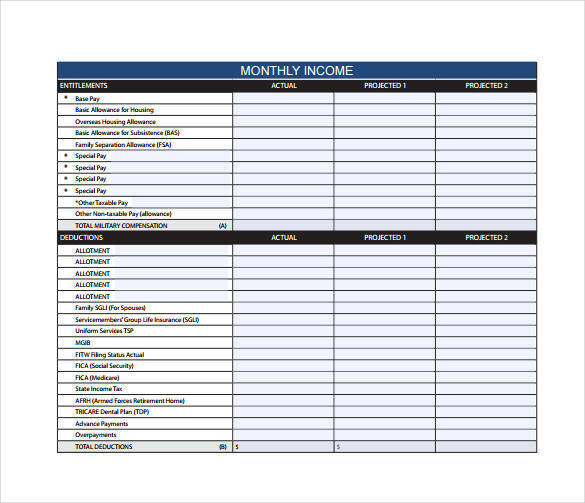 You may also see payroll spreadsheet samples & templates. Not all individuals know how to use computers and spreadsheets even with the technological advancement that we are enjoying right now. So even if the information are laid out neatly, it is still of no use if the person does not know how to use it. It may be easy to use at one point, but it is not that easy to create one on your own. It has to be done by professionals or those who have in-depth knowledge about spreadsheets, formulas, and how it works. You may also like mortgage amortization spreadsheet samples. Because of tons of information you have laid out in a spreadsheet, you will often find it hard to troubleshoot. It may just be difficult to find out where or what exactly is the cause of the error.